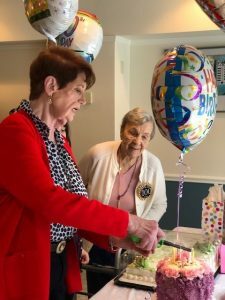 We celebrated Estelle Francesca’s 100th Birthday at Glen Arden! Estelle Francesca was born in Jersey City, NJ on January 29, 1919. 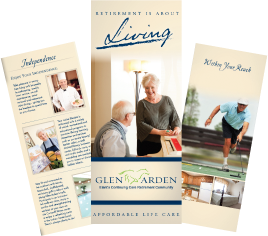 Estelle has lived in Middletown and Florida and has been a resident of Glen Arden since 2015. She spends time and receives loving care from Mark, Jill, Samantha, her husband Donnie and granddaughter Sophie. Estelle is an accomplished artist, who has won many awards in local art shows as her works hangs in venues around the world. She has also been an accomplished weaver and is the author of a Published West Indian Cook Book entitled Now Listen Good. Happy 100th Estelle, enjoy your family and friends at Glen Arden.